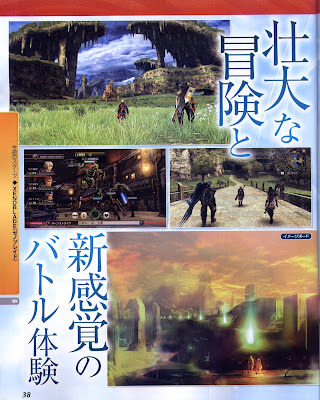 NintenGen: Xenoblade - first screens! This game looks amazing, nice art direction and great designs. 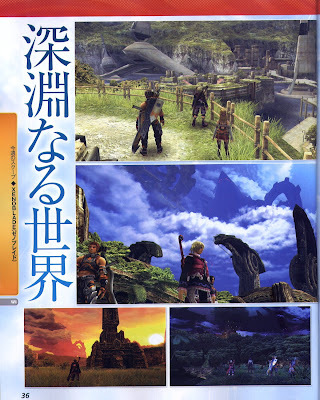 Looks similar I think to Monster Hunter 3, but that's a good thing! It's nice finally seeing some gameplay screens, consider me very hyped for this already. Read the post below this to see what this game is all about. I wish I liked RPGs because this game looks really good. Seeing the screenshot of the battle, with all the health bars, made me realize I won't get this game but it certainly looks great. "Wow"! Those screens look incredible. I'm digging the landscape! It seems Nintendo wasn't kidding about "...Ferrari under the hood...". It is kinda cool in a geeky way to find out that Nintendo holds back the true specs. Screens like these and the confession of integrated 3D technology in the GC/Wii GPU lets us tell the naysayers, "...told ya..."
We all know the Wii chipset is still potentially untapped. Heck the GC was untapped! I'm talking to you - you lazy devs/programmers! Well you can at least give the game a better chance than that can't you? The game is not going to be like old FF games were it's random battles and you can't see your enemy, it's going to be similar to Chrono Trigger. How could that be a bad thing? I wish that BioWare make a game for Wii -some classic RPG like KotOR.